Dog leash and harness sets come in handy when it's time to take Rover for a walk. It would be great if you could just take your dog out for a walk without needing to restrict him in any way, but in most cases it's just too dangerous. Nearby traffic, people and other pets all present temptations and potentially dangerous situations, so it's essential to keep your dog under reasonable control. Most pet owners find a dog collar and a leash sufficient for the occasion, but this set up works best when you have a cooperative dog. Some dogs are simply too boisterous to be contained by just a collar; they wind up choking as they tug on the lead and attempt to bound off in all directions. In cases like this, dog leads and harness combinations offer the extra amount of control you need to keep your pet from hurting himself. First, let's learn how to measure for one correctly, and then we'll look at a few great examples of what's on the market. Dog leads and harness combos typically come in small, medium and large sizes, so it's important to get the proper fit for your pet. A harness that is either too large or too small is bound to create bare spots and sores on your dog's skin. Girth: Think of this as measuring for a belt. Run a tape measure completely around your dog's body just behind his front legs. This measurement may be all that is needed for the average dog harness. Chest: Some harnesses are designed for a special purpose and may require a chest measurement in addition to girth. Using a tape measure, begin just behind your dog's elbow on one side, guide the tape across the breast bone, and end just behind the elbow on the other side. This measurement is typically half the length of the girth, but big-chested breeds such as Bulldogs and Bullmastiffs will measure larger. Once you have your measurements, compare them to the sizing chart on the set you want to buy and you'll know just which size to order. Now it's time to look at a few samples. One of the most common complaints among dog owners is their pets pull incessantly on their leashes when they're out for a walk. This can really spoil what would otherwise be a pleasant activity. The right dog leads and harness sets can help you train your dog away from this obnoxious behavior and allow the two of you to spend quality time in the great outdoors. The Halti is an ingenious combination of dog leads and harness that helps you gain complete control over your pet. A set of double leads attach to rings on the chest and shoulders of the harness, effectively allowing you to "steer" you dog when needed. Owners who don't care for a traditional thin harness may prefer a Non-Pull Harness manufactured by Sporn. This harness is made from an elasticized web mesh providing a greater area of support around the dog's neck and shoulders. This arrangement distributes the load of your dog's pulling across a greater area and virtually eliminates the harness sores dogs can develop with thinner dog leads and harness sets. Older dogs suffering from arthritic conditions and other pets with injuries and/or disabilities are not always able to wear traditional dog leads and harness combos. For these pets a Lupi may be the ideal dog lead and harness combo. The set uses a figure eight style harness to provide extra support from the front of the body, helping dogs suffering from back problems to move more comfortably. Many owners notice an immediate difference in their pet's posture and mobility when the harness is in use. Although you can't always leave your home without bringing along some necessary items on your walk, who wants to be weighed down with a tote when they go for a romp with their dog? The Bucchi Bag Hold-All and Lead presents a terrific solution. 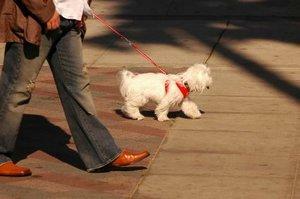 Pack your keys, wallet and cell phone in the bag and attach the bag and lead combo to your pet. Then the two of you can be off and running. We've only scratched the surface of what's available on the market. There are dog leads and harness sets in every imaginable color and style, and if you need one, there's certainly a perfect set just waiting for your pet.